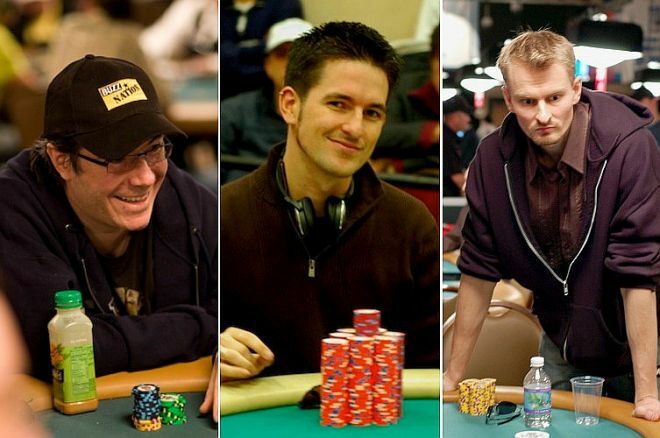 On this date in 2006 came a memorable WSOP Main Event hand involving Jamie Gold, Paul Wasicka, and Michael Binger. Nine years ago today, Paul Wasicka faced one of the hardest call-or-fold decisions in WSOP Main Event history. On this date in 2006 came a memorable WSOP hand involving Jamie Gold, Paul Wasicka & Michael Binger -- and an incredibly challenging call-or-fold decision. ”Hand Histories” looks back at famous poker hands in history, inviting consideration of the strategic decisions involved. It was on this date in 2006 that Jamie Gold won what was then the biggest prize in World Series of Poker history, and still the largest-ever Main Event cash of $12 million. Gold topped a record field of 8,773 that year to win the Main Event bracelet and first prize. Among the many memorable moments from that year’s final table was a hand that occurred with three players left — Gold, Paul Wasicka, and Michael Binger. The trio had each begun their tourney journeys a week-and-a-half before, and had played more than 12 hours and nearly 230 hands at the final table when what would become the most discussed-hand of the tournament took place. Gold started the action by limping in from the button with , then Wasicka called from the small blind with . Binger then looked down at in the big blind and put in a raise to 1.5 million. Without much deliberation, Gold called the raise. Wasicka thought for a moment, saying “Can’t have a hand every single time, Jamie... jeez” before calling as well. There was 4.65 million in the middle. The flop came , bringing a little something for all three players. Wasicka had flopped a straight flush draw, Gold had a lesser straight draw, and Binger had made top pair of tens. Wasicka hesitated a moment before checking, and Binger bet 3.5 million. Gold then instantly announced he was raising all in, a move that sent Wasicka deep into the tank. Wasicka’s deliberation continued for about a minute total before he finally pushed his hand away, shaking his head disgustedly as he did. Binger called right away, and when the turn brought the , Gold had made a straight and Binger was already drawing dead to finish in third. The river — now meaningless — was the , adding an extra layer of “what if?” to Wasicka’s fold. As far as the three players’ thinking at the time, Gold made his apparent via his table talk, adding afterwards “I’m just trying to get it over with” as they awaited the turn and river cards. Binger’s decision to call all in was also relatively uncontroversial. Having flopped top pair and what was likely the current best hand, Binger had already committed nearly half his stack in the hand, and as the shortest of the three, his call after Wasicka folded was clear. Wasicka’s decision to fold, however, was the much less cut-and-dry, eliciting a great deal of argument both for an against during subsequent months. Later Wasicka would explain his thought process at length to Andrew Feldman of ESPN. Among other points Wasicka would make included noting how “in a tournament, you’re not going to always do the exact math play.” Indeed, given the remaining payouts, the ICM (“Independent Chip Model”) consequences of his decision were highly unique, creating an incredibly challenging spot for him. After knocking out Binger, Gold would have nearly 79 million to start heads-up play while Wasicka had just over 11 million. They’d win three hands apiece, then on the seventh between them Gold flopped top pair of queens versus Wasicka’s pocket tens, Wasicka called Gold’s all-in, and the hand held to give Gold the win. Hold’em with Holloway, Vol. 39: How Much Did I Have to Raise to Get You to Fold?